Best Pop Up Canopy Tents – Spring has arrived and summer is right on its heels; we all know that one of the best summer pastimes is getting family (or not, depending on your family) and close friends together for a good, old-fashioned BBQ! Naturally, with BBQs, come abundant heat and sunshine; with that being said, pop up soccer tents are an amazing choice for a planned, or an impromptu gets together. Not to mention that pop up tailgate tents are also extremely convenient if you are the host of some other event that will require some form of shelter, it’s amazing for storage and easy enough to take between events. Let’s check out some of the top instant pop up canopies for this year so far. 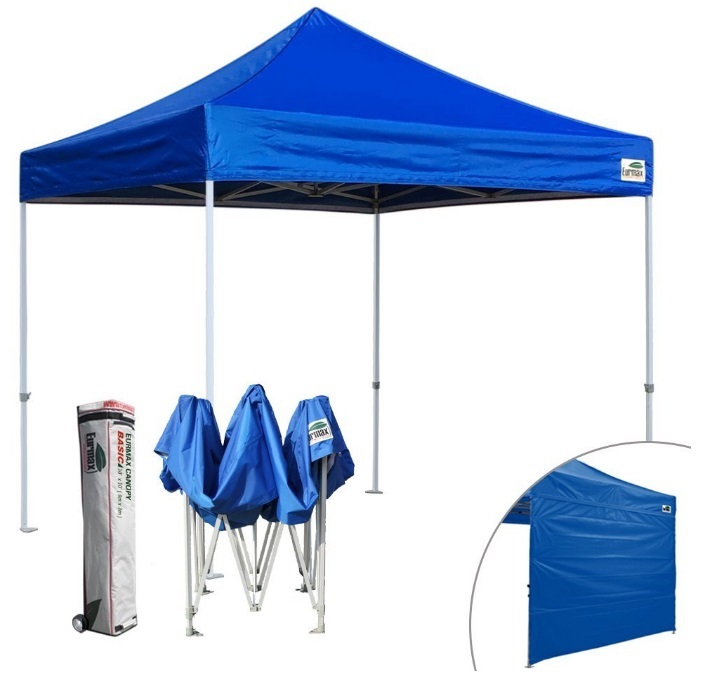 The EZ Pop-Up outdoor pop up canopy tent is made up of a sturdy and durable structure, with a black powder-coated rust-resistant steel frame that includes 100% nylon mold brackets, and 1 1/4” thick square shaped legs. There are also incredibly strong truss bars sizes 26mm X 13mm X 1mm, in addition to nylon feet that are equipped with two drilled holes and push-button sliders. The material that the EZ Pop-Up heavy duty pop up canopy tent is made up of includes 300 denier polyester with PU coating, and 100% waterproof, with heat-sealed seams; there are also reinforced stress points where the peaks poles meet the pop up backyard canopy. There is a heavy duty roller bag for easy transport of the canopy, in addition to a strong storage bag for ease, portability, tailgating and convenience. There are also E-Z glide wheels on the storage bag that makes it a breeze to navigate when making those trips to the beach, playground, or simply your own backyard; the E-Z Pop-Up mini pop up canopy also comes in a wide range of vibrant colours to select from. It’s a great canopy that provides good shelter and fairly sturdy; there have been some reports of the canopy flipping over a strong wind though so potential buyers will want to keep that in mind. There have also been some instances where the canopy did not fit properly on the frame or it did not stay secure. 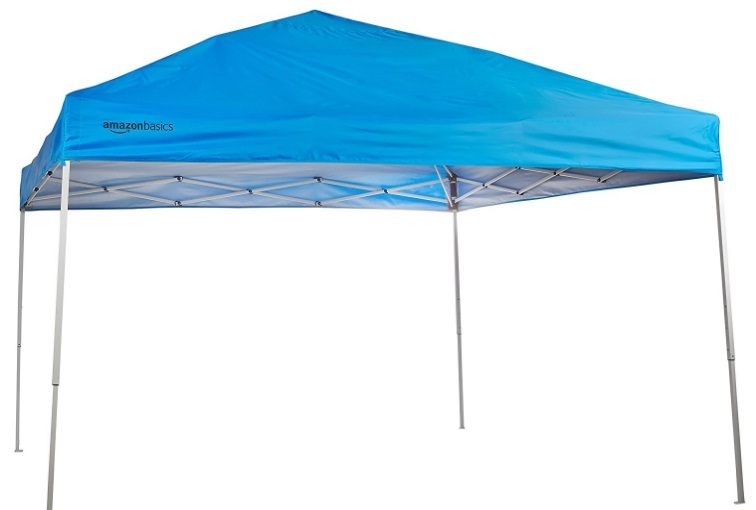 It’s a bit pricey compared to some other pop-up canopies on the market, coming in at about $180.00 on Amazon. 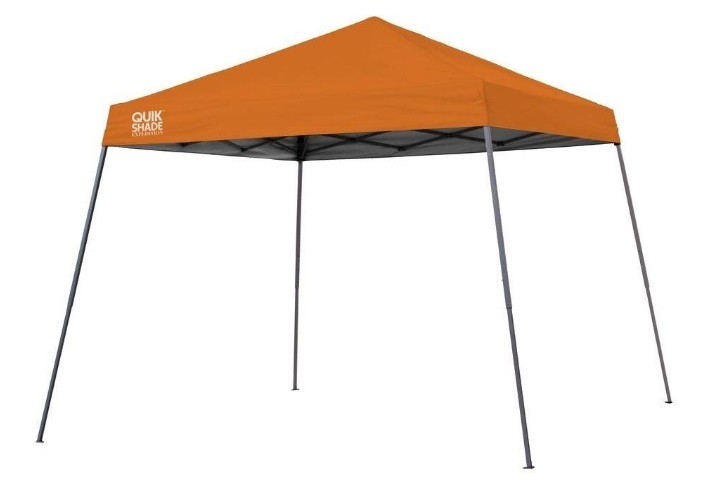 The Quik Shade Instant Canopy comes in a variety of colors, ranging in price; the orange option will cost you about $55 on Amazon and the others going up to $100 (depending on the color you choose). There are patented pull/push sliders and push-pin leg extenders that make assembly and adjusting incredibly easy and convenient. The Quik Shade easily assembles in less than a minute with a durable 150D top that has 99% UV protection; the Quik Shade is also fairly durable, yet lightweight so putting it up and taking it down should not be a hassle, especially if it needs to be done in a rush. Although the 10 by 10 pop up canopy is advertised to be 10 X 10, some buyers have received this particular canopy and it was significantly smaller. Some of the metal legs also became bent after only a handful of uses. The Eurmax is about $160.00 on Amazon so just a tad on the pricey side and is a commercial canopy frame; the Eurmax is made up of a durable full truss structure with square shaped legs, incredibly sturdy and resilient. 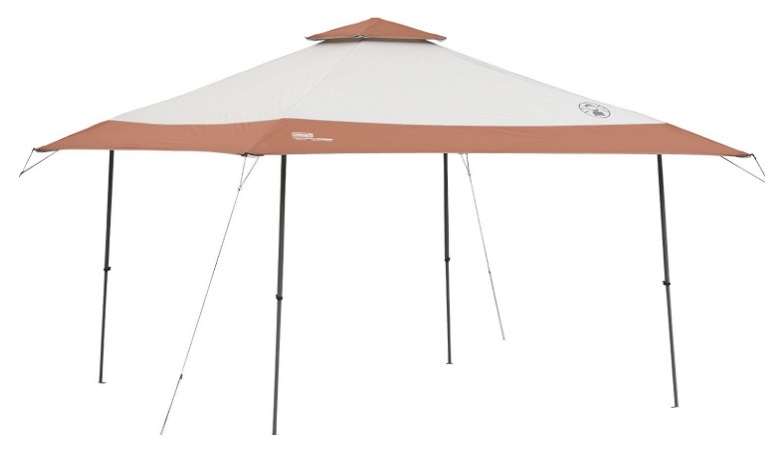 The Eurmax is rust resistant, with a hammer tone powder that has a coated finish and an industrial grade safety adjustment thumb-lock button and provides up to 100 square feet of shade. The material of the canopy top cover is a 500 denier, high-quality, polyester fabric; also, to prevent water penetrating the seams, the seams are sealed with stitching lines, making it 100% waterproof and blocks 99% of UV sun rays. The Eurmax comes with a durable carry bag for portability and convenience and also comes in several colors for a great level of variety. Assembly of the Eurmax is also incredibly easy and does not take long at all to do (even though you may need a couple of people to help if you are setting it up for the first time). It is a bit on the heavy side so although it comes with a carry bag, it can be a little difficult to lug around. Some of the Eurmax canopies’ structural supports has also broken down only after a few uses. The AmazonBasics pop-up canopy for camping & tailgating consists of a steel frame with a cathedral style roof for maximum headroom and comfort for those tall friends of yours. This pop-up canopy also has an angled leg design what provides approximately 96 square feet of shade and protection from the elements (although it is not recommended for us in prolonged rain or strong winds). The pop up rain tent cover also provides 99% UV protection from the sun’s rays and includes a carry bag for easy transport and convenience. Durable steel frame for stability; coating of the AmazonBasics canopy helps prevent and reduce peeling, chipping, and rust. The cost on Amazon is about $95 so it’s a price that certainly will not break your wallet; the total weight of the canopy is roughly 38 pounds so it’s not too hard of a struggle to pick up if necessary. This particular canopy has a few mixed reviews, with some of the negative reviews describing that the canopy falls apart only after a few uses and is incredibly difficult to assemble initially. The Coleman Instant Beach Canopy is a 13-foot pop-up canopy that costs about $145.00 on Amazon, making it mid-range in the area of pricing. The Instant Canopy can be set up in as little as three minutes in just a few simple steps; the material that the canopy is made out of specific for guarding/craft shows against UV rays and provides an awesome amount of protection from the sun and light rain. The Instant Canopy comes with a handy storage bag that easily fits into most vehicles; there are two-way vents in the roof that provides adequate circulating to make any visits in the canopy pleasant and comfortable. The Coleman comes with lightweight poles that are pre-attached with grips that allow the poles to easily lock in place. The corners of the canopy cover can tear easily, with the color of the canopy itself fading just as fast. Although it is relatively sturdy and easy to assemble, it definitely should not be put up in any kind of inclement weather as it has turned over in a strong gust of wind. Lastly, even though it is easy to assemble, it can be a hassle to take down and may take several people, at each corner of the canopy to dissemble; it has been said that this specific canopy may only be good if you just need an instant canopy for backpacking/craft shows for a short period of time. So, with all of this being said, I believe that you will never know for sure just how sturdy a particular pop up patio canopy is until it is being tested out in the “field” so to speak. Also keep in mind that if you reside in an area with high winds or rain you may want to invest in something a little sturdier than a pop up market tent, however, if you just need something fairly simple for a to get together or just simple relaxation, the above options should definitely be looked at. Be sure to keep your receipts as well just in case you need to return or exchange; it also will not hurt to review the customer service ratings of the manufacturer that you plan on ordering from, just in case you do need to return anything. There is nothing worse than poor customer service to deal with in regards to a purchase that you have already spent your time and money on.